Ah, it’s that time of the year when we have to think about the dance. No, not the Big Dance (i.e. March Madness). No, not impromptu dancing with your significant other when your favorite Rod Stewart song comes on Pandora. I’m talking about the Thanksgiving Kitchen Dance. I’ve been known to make a detailed timeline for when different dishes and pots need to go into the oven/out of the oven/onto the stove/etc. on Thanksgiving morning. Truth be told, I kinda like the timeline as I’m also a list maker…but I get it. Thanksgiving is one heck of an awesome holiday, but getting Thanksgiving dinner onto the table can be a bit like solving a Rubic’s Cube. Enter the slow cooker. Before we get into the wonder of these Slow Cooker Mashed Potatoes, I need to digress about Rubic’s Cubes for a moment. One of the highlights of Thanksgiving Day is football. Parade, food, family and football. I mean it’s not Thanksgiving until Uncle Bob falls asleep on the couch and snores his way through the 2nd half of the Dallas Cowboys game, right? But speaking of football, did y’all see that Ryan Fitzpatrick (QB for Tampa Bay Buccaneers) spent part of his summer teaching kids how to solve the Rubik’s Cube? It’s true! An NFL QB teaching a class on solving Rubik’s Cubes. How cool is that? To be fair, Ryan did play his college ball at Harvard…but still! But back to the Thanksgiving Kitchen Dance. Mashed potatoes are a key dish for our Thanksgiving table (along with homemade macaroni and cheese), but I always underestimate the time it takes to make mashed potatoes. Always. I was talking to my Mom on the phone the other day, and she told me she’s switched to making a Slow Cooker Mashed Potatoes recipe. Say what? Mashed potatoes in the slow cooker? The thought of eliminating one pot on the crowded Thanksgiving stove totally got my attention! We’ve always used evaporated milk as our secret ingredient for creamy mashed potatoes, but my Mom told me to use sour cream. 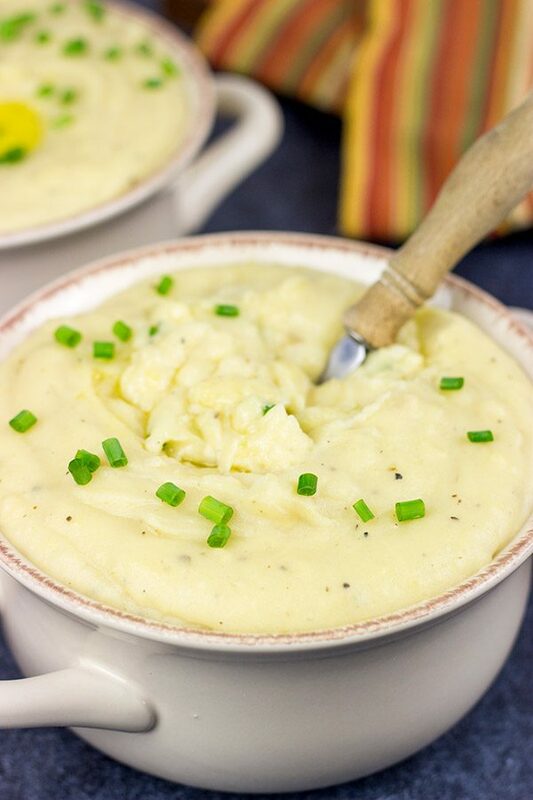 And these Slow Cooker Mashed Potatoes absolutely rank up there as the best mashed potatoes I’ve ever eaten. Of course, all of the butter helps, too. As my friend Kelsie pointed out, butter makes everything better! 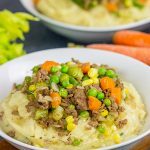 I know mashed potatoes are one of those recipes where everyone has their own unique (and sometimes secret) method…but give the slow cooker a shot here. If you don’t trust me, make a trial run of Slow Cooker Mashed Potatoes this week. And then make them again on Thanksgiving morning! Using a 6-quart slow cooker, add potatoes, butter, salt and pepper. Stir and add 1 cup of water/stock. Cover and cook on high for 4½-5 hours, or until potatoes are tender. Add sour cream and warm milk (start with ⅓ cup). Haha! Thank you for the shout-out; at first I was like, hey your friend spells her name just like I do! Then I realized you meant me :). Can I please just say how much I wish I’d had this recipe a few years ago when I did Thanksgiving dinner entirely by myself? My prep list was 10 miles long and any shortcut (and space on the stove) would have been so welcome. 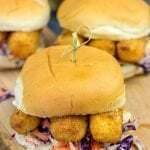 Next time I tackle Thanksgiving I’m totally making these! Happy Friday, David! Hahaha…you crack me up, Kelsie! 🙂 I have totally tacked Thanksgiving by myself back when I loved in Louisiana, and it’s a real labor of love. And my mashed potatoes were good, but they always left something to be desired. Not anymore! 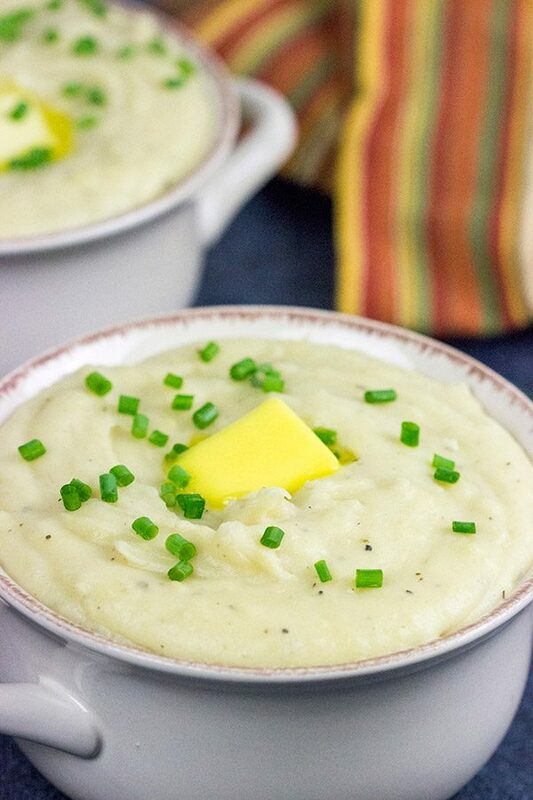 This slow cooker version is now my go-to mashed potatoes recipe…forever and ever and ever! Yay, butter! WOA – David, mashed potatoes in the slow cooker sound even more easier than my version of baking ’em! I’ve so gotta try this next time! And I’m wondering if Greek yogurt would be ok to sub for that – only one way to find out – and that’s to just do it! BTW that tidbit about Ryan Fitzpatrick is just too cool! Here’s hoping y’all have a wonderful weekend of pre-Turkey day dancing – cannot believe it’s literally around the corner! WOA this year has zzzzzomed by! Sour cream mashed? I could eat an entire pot myself! My favorite part of Thanksgiving football is that it provides the perfect distraction to allow me to have 2nd, 3rd, and 4th slices of pumpkin pie unnoticed. In my book, the whole point of Thanksgiving is to give thanks … for pumpkin pie with Cool Whip. 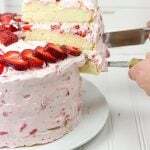 It’s got to be Cool Whip. It’s texture is somehow perfect for pumpkin pie. I feel I must make it clear that I’ve had this unquenchable thing for pumpkin pie way before the dawn of the age of “Pumpkin Spice.” I have to give credit to the pumpkin spice craze, though, in as much as it has resulted in pretty good pies available at the grocery store from pretty much fall through spring, but then – I guess because life always has a knife up its sleeve – Cool Whip is sold frozen! So you have to bring home your impulse-buy pie, and wait for the Whip to thaw! Arg! You know…since you’ve had a pumpkin pie addiction way before the onslaught of all things pumpkin spice, then I crown thee Pumpkin King! Maybe you can wear a crown made of pumpkins? Or at least of pumpkin pie? 🙂 And I hear ya about Cool Whip + pie. It’s a magical combination…and even more so when you add the couch into the mix. Thanks, Jeff! 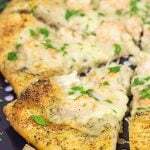 The sour cream (or as Shashi pointed out above, Greek yogurt) adds a ton of flavor here! And of course the butter helps, too. These are seriously my favorite mashed potatoes now, and I’m never going to try to make them any other way. 🙂 Thanks, Deepika!! LOVE IT ! (But is there anything you post that I don’t like…. answer is no 🙂 ) Have a wonderful day! You are too nice, Amy…thank you so much!! 🙂 Happy Monday, my friend! Want to hear something kinda wild? My friends have a son who does Rubik’s Cube competitions, and he literally can solve one blindfolded in like 30 seconds. It’s craziness! Plus he’s about 14 years old. But yes, it’s crazy how when you have a bunch of dishes to cook, you have to really time it out. Otherwise, it gets stressful! And, I always seem to have more time than I think.. and then boom, I have just an hour and a lot left to do! Wait. Rubik’s Cube competitions? I didn’t realize they had such things! And blindfolded!? How is that even possible?? Maybe your friend’s son is destined to be a Rubik’s Cube champion…or a quarterback in the NFL. 🙂 Also, these slow cooker mashed potatoes are seriously the best mashed potatoes I’ve ever had. And you better believe I’ll be pulling this post up next Thursday morning when I start prepping for Thanksgiving! Thanks so much, Nicole! I haven’t thought about Rubik’s Cubes forever. Truth: I don’t think I ever solved it, not even once. But I remember a friend of mine who could do it in a few seconds no matter how ‘messed up’ the puzzle was! 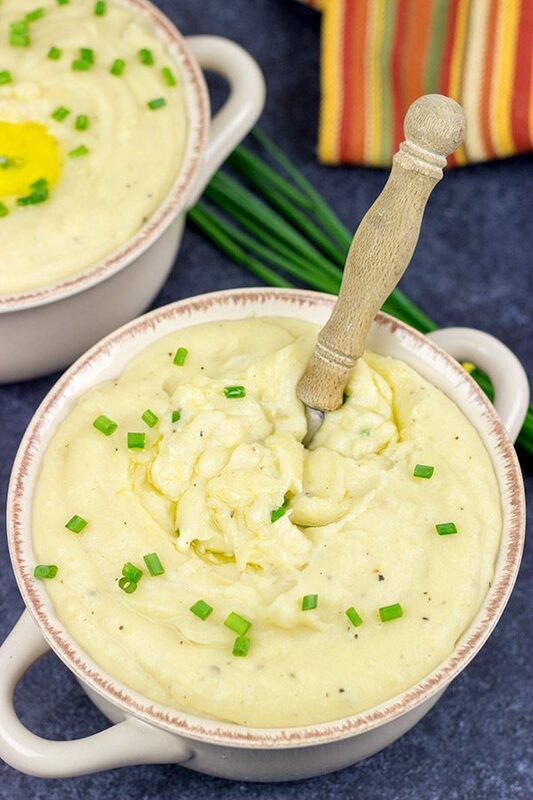 Mashed potatoes are my favorite part of Thanksgiving dinner and I love this super convenient method! 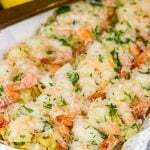 These potatoes sound A-MAZ-ING from a prep and taste standpoint! I pinned them to my Thanksgiving board – can’t wait to try them a week from Thursday! Thanks for the recipe, David! 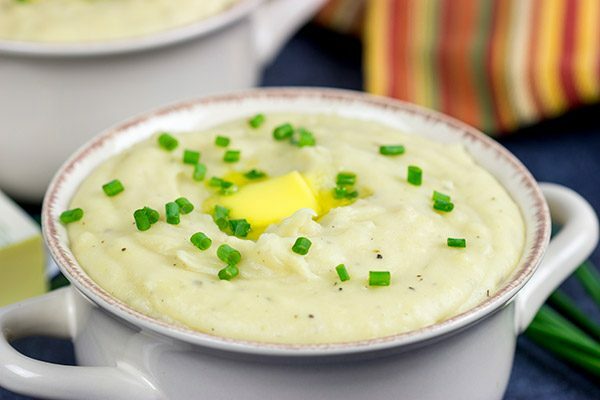 Oh my gosh, Laura…the slow cooker is the way to go with mashed potatoes! I thought I had done something wrong when there was still a bunch of liquid in the slow cooker after the cooking time was up. But a quick blend with a mixer and these become the creamiest, most delicious potatoes I’ve ever had!! 🙂 Thanks so much for stopping by, my friend! I love mashed potatoes and these sound amazing. 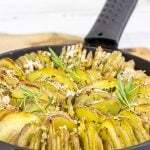 I have never tried making them in the slow cooker, need to try that. Thanks for the tip on the evaporated milk. 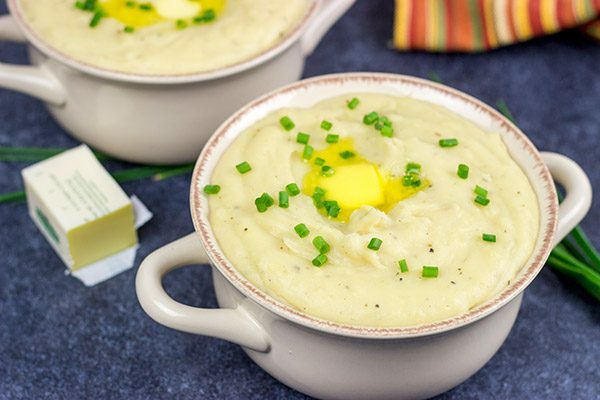 You should definitely try these mashed potatoes in the slow cooker, Dawn! Like definitely!! 🙂 These are without a doubt the best mashed potatoes I’ve ever eaten…and this is now our go-to recipe for the holidays! Thanks so much, my friend! Missed this previously David. Just got a slow cooker last week from a friend who didn’t want hers and this recipe is SO on our table for our Christmas Day feast. Cannot wait for it! Thanks. Hey Neil! 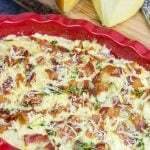 So glad you stumbled across this post as these really are our go-to mashed potatoes now. In fact, I just made these for Thanksgiving over here, and they were a huge hit…they’re also all gone, so I need to make another batch soon. I’m thinking for Christmas! 🙂 Thanks so much, my friend!